It seems everything in fashion this season is embroidered. Embroidery made its comeback last year spring, and since then we’ve seen it absolutely everywhere, either with a lawn trouser or even jeans, everything has embroidery on it and we are in love with this trend. 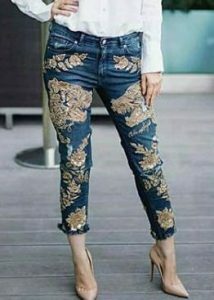 The fashion industry is taking the streets by storm as everyone is striving for a pair of their own style and shape of embroidered jeans or trousers. Just know that these are the essentials that will take your outfit to the next level. Recognized for the beauty it can add to understated garments, embroidery can make your outfit really come to life. Designers have added blooming colors to the shirts with floral embroidered trousers and everyone seems to love it. 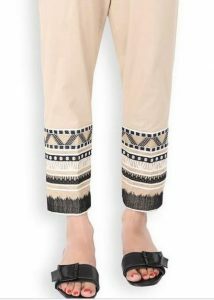 Not only do these trousers look insanely stylish and comfy, they also embrace two of our favorite seasonal trends: cigarette pants and embroidery. These are in neutral colors, pair them up with nice summery printed shirts and your summer wardrobe is ready! Embroidered jeans are a staple piece that always catches the eyes of others around. Each patch and stitch woven in brings out a piece of yourself others may not catch at first sight. 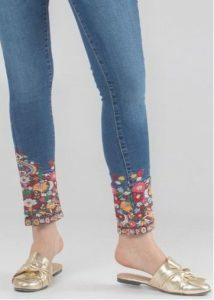 It’s a hard sight to miss, the vibrant patchwork and embroidery bringing a fresh pop of life to your average pair of jeans. So, are you on board with this new fashion trend for this spring? Don’t rush into opening your own embroidery club, find the hidden jewels in the stores you regularly pay visits to and let your demands and the fashion offers meet halfway.